NorthPoint Office Furniture has numerous front office desk options for business owners in Marietta, Georgia, and its surrounding areas. Founded in 1994, our family-run business offers top-quality furniture with budget-friendly prices. Additionally, whereas many other furniture stores may have employees that push you to make a purchase, our staff acts as consultants to our customers. This means that we’ll work with you and learn about your budget, needs, and preferences in order to make helpful recommendations. Plus, you’ll be able to see our products, including different front office desk choices, at our 8,000-square-foot showroom located in Canton. This will help you visualize what our pieces will look like in your office, enabling you to make a well-informed purchase. Aside from having an extensive selection of furniture, NorthPoint also carries different styles for many of our products to better ensure that you find the right fit for your office’s current décor. For instance, we carry transitional, contemporary, and traditional pieces. 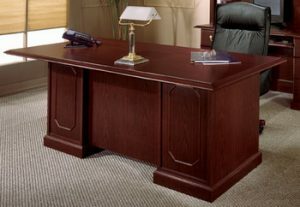 To learn how NorthPoint Office Furniture can supply you with the front office desk you need, or to inquire about our other furniture pieces, contact us today. We are proud to provide Marietta, GA, residents with the furniture they need at prices they’ll love.